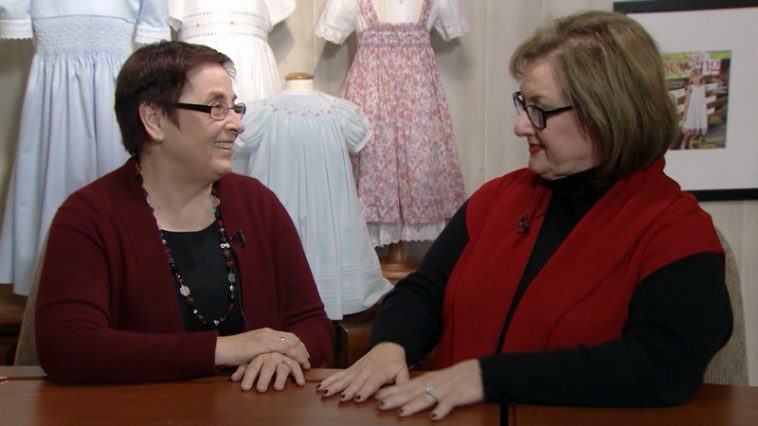 I had the immense honor of interviewing master teacher and star of the sewing world, Gail Doane not so long ago. She was in our Birmingham office to record her Classic Sewing exclusive videos when Gail and I sat down to talk. She shared about her sewing journey and answered questions about her favorite projects and designs. She even gave her best advice for all of us who sew! Gail is an internationally recognized expert in sewing technique and design. She lives the dream in that she has taken her passion and made it her career! At a Smocking Arts Guild of America (SAGA) convention in 2001, she was told she should never sew a design by anyone else. That was the day that she began her design business. Her signature style is recognizable in the tiny details present in all of her pieces. I have always wanted to attend one of her sewing classes, which is why I am extra excited to be working with her to provide Classic Sewing exclusive class videos. You’ll be able to sew right alongside Gail from the comfort of your own sewing room! In the Smocked and Beaded Dress video, Gail gives detailed instructions for complete construction of her beautiful dress design. With this video series, you can watch and re-watch Gail’s techniques up-close until you have mastered her skill and precision. Her easy-to-follow directions are wonderful for sewists with any range of experience. 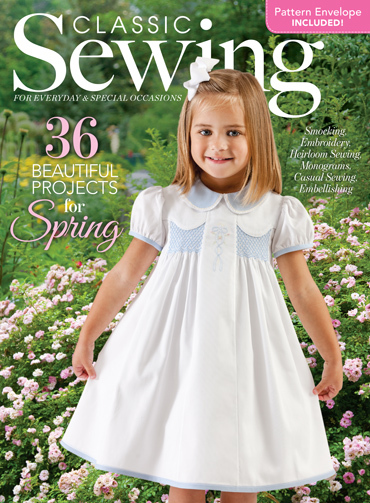 Visit the Classic Sewing website to learn more about Gail’s Smocked and Beaded Dress video. I hope you will enjoy my interview with Gail as much as I did! Have you taken a sewing class? I was a member of SAGA in Independence, MO, in the 1980s. I smocked beautiful dresses for my older daughter, who wore one every Sunday to church. I smocked lovely geometric patters as well as fun picture smocking. God blessed us with a second daughter 10 years later who also wore them. Now my 3 granddaughters wear them! My grands call them their “mommy dresses” and dance and twirl in them endlessly! The dresses have held up perfectly for this next generation. What joy it is for me to see these beautiful garments on my granddaughters! I have taken so many sewing classes over the years, including about 17 times at the Martha Pullen School of Art in Huntsville. Early on, I took a class with Mirella Oroya on hemstitching and the garment was almost entirely done by hand. I was in way over my head on that one. Gail Doane was a student in that class. I had heard of her but she wasn’t really “famous” yet. This was probably early 2000’s. A few years later I drove several hours to a SAGA event that featured Gail. I have that dress and jacket, made from a sweater and duplicate stitched. Gail is amazing and a master at what she does. Very down to earth. BTW, she has told me she never finished that hemstitched dress. I did. Sad to say, I only have one granddaughter and she is now 18. The days for sewing little girls dresses are over. Wow. It’s a great skill. I know how to sew simple things; I used to make all my clothes, as we did in the ’70s and early ’80s, but I am not talented enough to pull it off today. When I see the work of the “petits mains” who make the haute couture pieces, I am in absolute awe. Anybody who can make/create gets my admiration. That was so very inspiring! You are so right about sewing not being a race. When I first started sewing, I needed that immediate feedback, instant gratification, and I would hurry through to finish my garment so that I could wear it immediately. But, as I learned to feel pride in a job well done, I slowed down and perfected my skill. I so love to sew that I can lose all track of time. But, like most people, I suppose, the sad thing is that I have so many other tasks that I have to do that I often delay my reward of sewing and because of that, rarely get to do it. I do keep an embroidery project going, though, which I can take with me when I have to sit and wait. I admire smocking and find it to be so beautiful that I often purchase nightgowns and blouses which have it, but when I attempt it, I have a lot of trouble getting it to turn out right. I really enjoyed your interview of Gail Doane. I enjoyed or video very much! However, as I’ve said before, right now my sewing machine is a book end on my desk at home. I’m great at mending, but my mom did not sewband sadly neither do I. I know at 71, it’s never too late, however to date I have not found the time. My wonderful dear grandmother made the canopy and matching ruffle for my little girl’s canopy bed. She was a marvelous seamstress and made lovely things for me and our children (and taught me to knit and crochet) but I did not take the time to learn the art of sewing. Back to “never too late”….maybe…. Thanks again for your amazing blog! Great interview! I am a new sewer and this interview so inspired me! What a delightful interview, Phyllis and Gail! I have wonderful memories of little girl’s smocked dresses, none of which I made. My Mom made a baby dress for me with a beautiful smocked front, both our girls wore it, and both my granddaughters too. Thank you for keeping this beautiful, traditional sewing alive! A wonderful interview with such a talented and inspiring teacher! Purchased Gail’s video last week and watched it straight through. Although I have very limited smocking experience, I believe I can complete this dress. I’ve ordered my supplies, and once I finish some “deadline” projects, I’ll be starting this. Gail’s step-by-step instructions are so clear and thorough. Love the video and can’t wait to get started. I’ve also encouraged a close friend to purchase it as well. Is there any chance it might come out as a “hard copy” DVD? Many years ago I tried to learn to smock. They actually taught us a little coverlet for an Easter egg. What a beautiful art! My mom’s smocking work was beautiful. I am blessed to have a christening gown that she hand made all french seamed with smock work. She was self taught.